We know how important your event is to you. The Martin's Manner is our way of ensuring that your high expectations are not just met, but exceeded. It is reflected in our meticulous attention to detail, in our gracious service, in our award-winning culinary creations, and in our magnificent catering halls. The Martin's Manner is the difference between your event being good, and being exceptional. We've been in business for over 55 years, and we're proud to have earned a reputation as the Baltimore/Washington metropolitan area's top catering firm. We have just one goal, and that is to make your event special. We realize there's no such thing as a small detail. That's why each event has a dedicated ballroom manager whose entire responsibility is to attend to your every need. We even have a MSWDMAM form – short for "Make Sure We Don't Make Any Mistakes" – to ensure a flawless event. 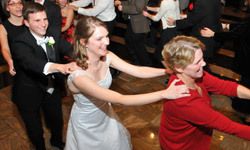 We truly do take your event personally, and that's why generations of customers have entrusted their most important events, and most cherished memories, to Martin's. Take advantage of our expert event planning services. We have nearly 50 years' experience planning extraordinary affairs and attending to every detail. Our seven banquet halls provide an unmatched setting for your event. And our award-winning chefs can create everything from box lunches to exquisite full-course dinners. In short, you can count on Martin's to make your event a total success. 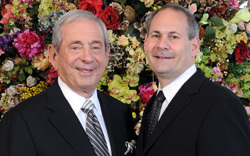 Martin's Caterers was founded in 1964 by Marty Resnick. It started as a single location. Marty is fond of telling the story of how he turned to the Small Business Administration for a small loan after he was turned down by the banks. That, together with his own savings, made it possible to open Eudowood Gardens in Towson, Maryland. In 1969 he opened Martin's West in Baltimore. The company has grown since then, and today we have seven locations and 700 employees. It is still very much a family-owned business, and that is one of the things that is so special about Martin's Caterers. Each of our managers has been with us for an average of 15 years. In 1991 Marty's son Wayne Resnick took over as President. (Marty continues to oversee things as Chairman of the Board.) Wayne's strong leadership has taken the company to new heights. We've never forgotten the reason we're in business, which is to make each and every event truly special. 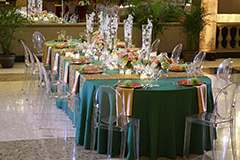 Gracious service is a hallmark of every event at Martin’s. We’ll make your guests feel special.